Kim Dwinell likes stories more than the beach. Almost. Maybe it's a tie. 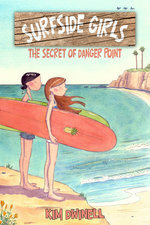 She first had a career as a beach lifeguard, and then a career in animation, and now combines her two loves in her first graphic novel series, Surfside Girls. She also teaches Animation at CSU Long Beach. When she's not in the classroom or at her desk, she might be running a 10K or out on the ocean in her boat or on her board. She lives on a tree-lined street in sunny Southern California with her husband, son and Springer Spaniel. Sam and Jade are back! Get ready for more ancient mysteries, beautiful beaches, cute boys, and wild adventures in this delightful full-color graphic novel.